This week's Aquascape Analysis is Tank 22 from the ADA Europe galleries. It's different from previous aquariums in that it is an sanzon iwagumi style nature aquarium, which is a subset of the nature aquarium style. It contains only a few different species of plants and one species of fish. It also makes use of rock as a prominent hardscape in a distinctive non-equilateral triangular arrangement. You'll notice the rocks are placed so the largest rock is at the peak of the triangle and the two smaller rocks seem to lean or point towards the largest rock. This is the basis of sanzon iwagumi. The profile of an iwagumi tank is almost always flat. This is due to the use of carpeting and grassy plants. If anything there are gentle, natural slopes to emulate nature, but no major profile-defining shapes. This helps to concentrate the viewer's attention on the rocks and convey a sense of openness and airyness. As for the focal points, in an iwagumi tank, these are almost always the rocks that make up the hardscape. Usually the main focal point is the largest, most prominent rock. In this aquascape, this hold's true. The two other rocks form the secondary focal points. Notice how the two secondary focal points (yellow) flank the main focal point (red) and how the main focal point seems to follow the Golden Rule. The flow in an iwagumi tank is almost always exclusively following the shapes of the hardscape, as these are almost always the focal points. Therefore the flow is very simple and relaxing. 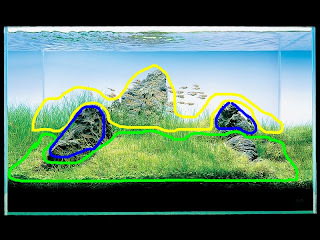 As for the foreground (green), midground (blue), and background (yellow), these are harder to define and less concrete in an iwagumi. Often, an iwagumi will look like one large foreground, with no discernable background. However, in this iwagumi, the two smaller rocks seem to anchor the midground. The background consists mainly of the largest rock and the taller grass towards the back of the aquarium. Again, the ground in an iwagumi are much harder to define and often subjective. Overall, iwagumi tanks are based on relaxing simplicity and visual appeal. The use of three stones is not random: the human mind prefers odd numbers visually. Using only a few plant species keeps it uncluttered, and using prominent rocks as hardscape provides clear focal points and guides for the viewer's gaze. GREAT article! Great analysis! Very Very inspiring! thanks a ton! I just found your blog today and I love it. 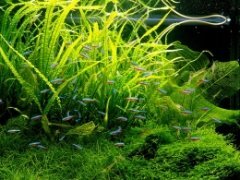 The photos are amazing and I look forward to reading the past posts and picking up a few pointers on aquascaping. Usually in the Spring I get the itch to redesign my tanks and it's just about time to start planning it. I hate to be a bother or steal your secrets, but what kind of rock is used? And what kind of plants are in the front, middle, and back?